We know that hydration is important and compare to buying bottled water every time it is more cost effective to carry your water from home; you can even carry your favorite beverages with you instead of plain water. There are many brands offering water bottles out there and today, we are going to introduce you to two of it. They are Hydro Flask and Thermo Flask, if you are interested on knowing them more, go ahead and read our article below. Hydro Flask is a brand of vacuum insulated stainless steel food and beverage container manufactured by the same name company. This company was founded in 2009 by Travis Rosbach and Cindy Morse, inspired by their experience of founding their water becomes lukewarm after spend a day in a beach. The company has been sold to investor and continues to grow since 2011. They even doing a partnership with the World Surf League or WSL and take part in various prestigious surfing events. The company continues to strive for the better and try to bring new, innovative solutions to their customer. Hydro Flask is very popular; the brand has been featured in various articles in magazines and has won awards since 2013. 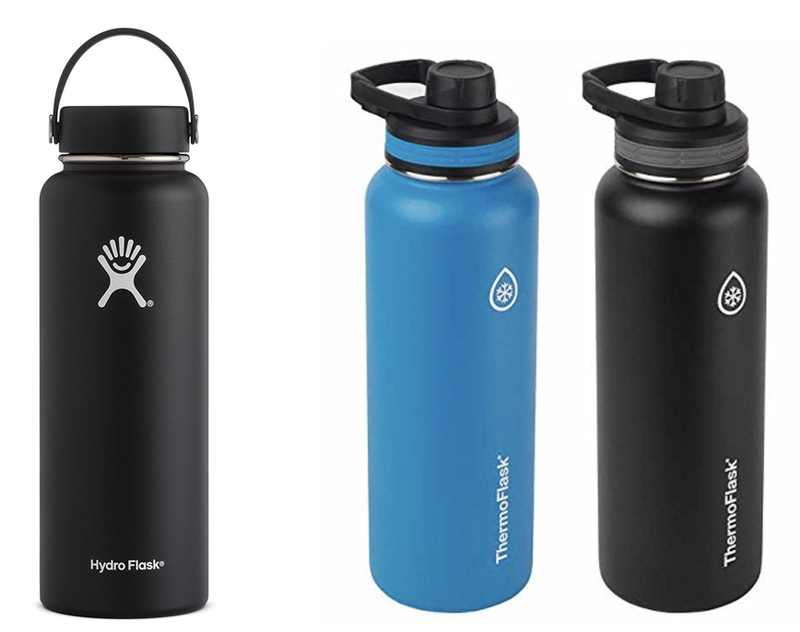 Hydro Flask currently offers water bottle, tumbler, coffee flask, beer and wine flask, and food flask. Aside from offering containers, they also have an apparel line including shirt, hoodie, and hats. Even though all of their containers have different names, the idea is still the same and you can practically use them to contain your drink or carry water. All of Hydro Flask containers are featured with the company proprietary technology called the TempShield. The one container in our example above is the wide mouth water bottle in black. Aside from the wide mouth, they also have the standard mouth and kid’s bottle. The wide mouth comes in various sizes and colors to match your styles; they offer 18 oz., 32 oz., 32 oz. with straw lid, WSL 32 oz., 40 oz., and 64 oz. The Hydro Flask wide mouth is designed to ease the user to insert ice when they want to carry cold beverages and fasten the filling process. The product also claims to be big enough to fit in most backcountry water filters, so you can carry it together in your adventures. Hydro Flask water bottles are able to keep the temperature inside the bottle to stay longer than regular water bottles, thanks to its TempShield technology. This technology is claimed to be able to keep hot water up to 12 hours and ice cold water up to 24 hours, so you can enjoy your beverages just how it should be. The lid is also added with another technology called the Honeycomb insulation to enhance its capability in keeping water temperature. If you are interested on other insulated water bottle, read our article on Hydro Flask vs Contigo here. The material to build the body is using 18/8 durable pro grade stainless steel that will not retain any flavors, so you can bring flavored water or beverages with ease and tough enough to be your adventure’s partner. Hydro Flask is also made with BPA free material to ensure you that your drink will not accidently alter your genetic make-up. The bottle is easy to grip, thanks to its proprietary powder coat, which makes the bottles sweat free, so your hand will not slip when carrying cold drink. Thermo Flask is a brand of insulated water bottle from Takeya. The one in our example picture above is the two pack 40 oz. Even though it is branded as Takeya, the logo and name is different from other Takeya products. There is no clear information whether the product is the same with Takeya bottle or not. Currently, you only can purchase the product through stores and you will not find another product in its line in their homepage. However, Thermo Flask is still a great product that used and liked by its users. All of Thermo Flask bottles are manufactured in China but you can get your hand on them in many online stores easily and in very affordable price. Their water bottles are made with food-grade 18/8 stainless steel to help you carrying your flavored beverages without retaining the flavor and affect your next drink taste. You also shouldn’t worry about accidentally altering your genetic makeup when drinking with Thermo Flask, since it is made with BPA free material. The lid is made with silicone O-ring to prevent leaking. The lid is designed to optimized the function of easy hydration, means you can sip with ease on the go without having to worry about spilling your water. In Thermo Flask lid there is loop-top attached to the cap, so you can insert your finger or clip in and carry your bottle easily when on the move. The body is built using double wall to keep the temperature inside the bottle longer than regular water bottles. The product claims is that it can keep hot water stay hot up to 12 hours and cold-water stay icy cold for up to 24 hours. However, when you open the lid often, the temperature may not stay as long as if you leave it closed. The outer body is coated with special powder to keep the bottle from sweating and wont transfer heat, so you can handle it with ease. Since it will not transfer heat, you should keep it from children when contain it with hot water. Now, let’s compare Hydro Flask with Thermo Flask. After reading our article above, we know that both of them have almost the exact same features, from the material it used and the ability to retain temperature. Both of them are made from 18/8 stainless steel and able to keep hot water for 12 hours and cold water up to 24 hours. What differ them in our picture above is only the lid. 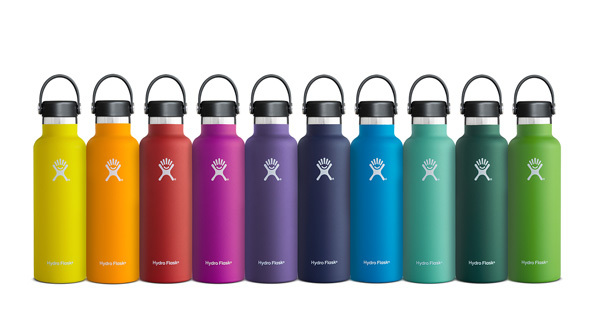 However in product variants and color options, Hydro Flask have wider range of varieties you can choose to match your taste. All in all, the option is yours to make. 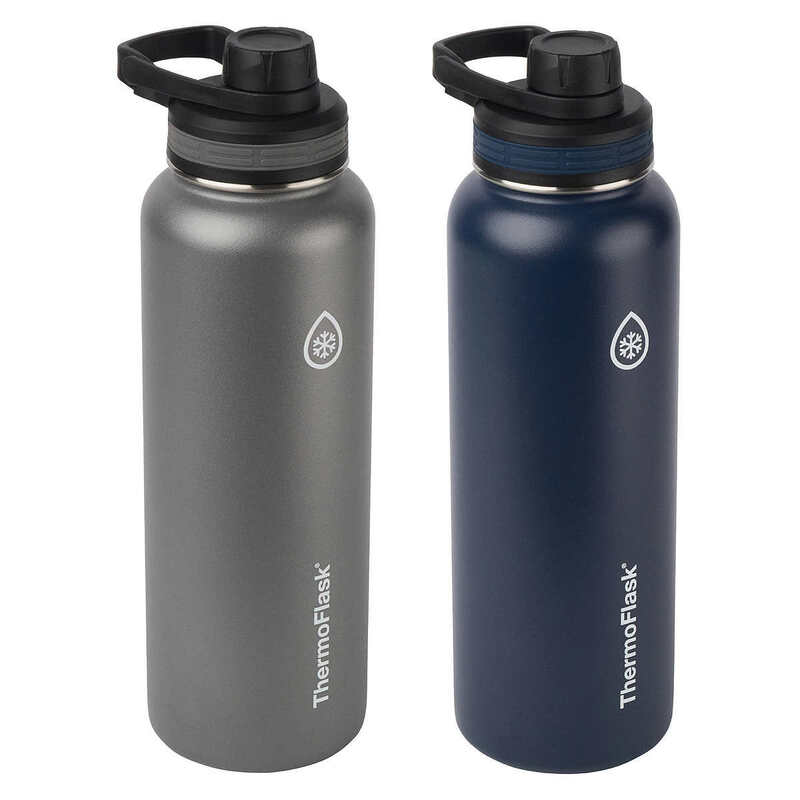 In our opinion, if you want more color and size options, you can pick Hydro Flask, but if those things doesn’t bother you, we highly recommend Thermo Flask, since it has the same ability and more affordable than Hydro Flask.